By now, Candice Payne’s kind act during Chicago’s polar vortex is fairly well known. Payne, managing broker at 5th Group Realty & Management — and her husband — helped provide hotel rooms to dozens of homeless people in the South Loop during last week’s subzero temperatures. But at a Wednesday appearance on the “Ellen DeGeneres Show,” the real estate agent and her husband got a surprise gift of their own. DeGeneres handed them a $50,000 check. 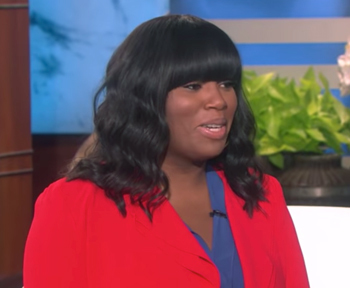 The talk show host was prepared to give the couple $25,000, but after they recounted the story on air, she called Walmart during a commercial break and got the retailer to double the donation, according to the Chicago Sun-Times. Payne said she hopes to use the funds to start a nonprofit. During the brutal cold, Payne had initially rented 20 rooms for the homeless at $70 each at the Amber Inn in Bronzeville. When Payne asked her friends on social media to help transport the homeless to the hotel, her gesture went viral. More Good Samaritans joined in, helping the couple book 71 rooms for five nights, according to the Sun-Times. For More Information Call Marialby Today! Llamen a Marialby hoy para más información! Share This Real Estate Market News, Choose Your Platform!